Abbey Flyer Users Group – ABFLY – New Trains! Well sort of…. 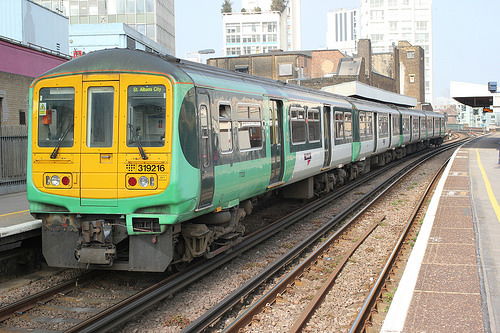 LM has taken four 319s into its fleet to cover for the loss of seven class 321s (321411 to 321417). Whilst five 321s were diagrammed daily from the seven sets available, LM is now using three of the four 319s each day, with one unit working the branch whilst a pair of units covers the 0741 Bletchley to Euston and 1705 Euston to Milton Keynes workings. Between the peaks the units are stabled at Camden and they return to Bletchley carriage sidings at the end of the day. Maintenance is carried out by Siemens at its Kings Heath facility in Northampton. The other two diagrams that used to be worked by 321s will be covered by a pair of 350s, following work with Siemens to make an additional two sets available for service each day. Although 319s are similar to 321s, training has still been required for all staff involved. LM has worked closely with Northern Rail, which has also taken on 319s in recent months, to understand the challenges of the units. It expects that reliability of the fleet will improve once they are working solely on AC power, with the constant switching between AC (overhead line) and DC traction (third rail) when used on Thameslink services having been a major source of technical issues. The sets have been refreshed internally, with new seat covers fitted – a very welcome improvement for Abbey Line passengers who have had to suffer years of shoddy interiors on the careworn 321s. Unfortunately though they have not had the modification which the Northern 319s have had, to fit door controls at every door position, which could have helped to reduce ticketless travel on the Abbey Line. ABFLY will push for this modification to be a commitment as part of the forthcoming Direct Award franchise agreement. Reaction to the new trains by Abbey Line passengers has been mixed. In the first week of operation (commencing Monday 21st September) the 319 in use appeared to be disappointingly dirty, particularly in the carpeted area between the doors – which was very heavily soiled. Other areas of flooring ranged from ‘ok’ to ‘grubby’. Next day (Tuesday 22nd) the reliability problems kicked in when one train during the rush hour couldn’t open its doors at Garston, then on Thursday 24th all branch trains were cancelled in the afternoon due to a train fault. Replacement buses were put in place, but with typical LM efficiency at one station passengers were first directed to two different bus stops, before the bus eventually arrived and loaded in a completely different location! Week commencing Monday 28th September got off to a much better start, with the train reported as having, “Wall panels clean and bright. Floors of the solid plastic / linoleum type, even showed signs of recent cleaning…. !” And the doors seemed to open ok. However it is still being reported that the 319s seem to be running slower than the 321s, with the 0635 mainline connection to London now being regularly missed. Although things seem to have improved from the first week, ABFLY continues to monitor the situation.